Say thanks to the boss you appreciate because he does the job you know you never want to have! It's tough leading a team, and it takes so much hard work. Send an inspirational boss's day card to your boss today to say thanks and show your appreciation for his or her amazing leadership and support. A boss's day greeting card gives credit where credit is do. When you have an exceptional boss, make sure to tell them so! Boss's day is right around the corner and a thoughtful boss's day card is a fantastic gesture. If your boss inspires you to do your best and you feel proud working where you do, this happy boss's day card is for you. 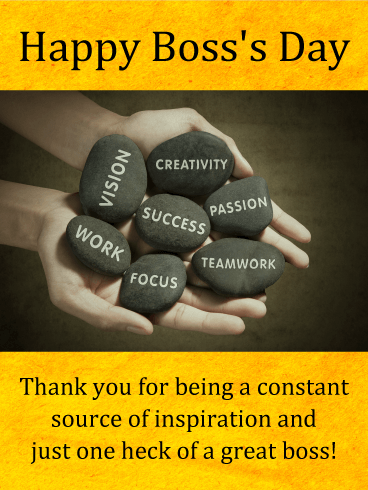 Show your gratitude with a cheerful and heartfelt boss's day greeting card. Even bosses need a little love! Send your amazing boss and beautiful boss's day greeting card to let her know she truly makes a difference in the workplace. A great leader provides inspiration to their staff with vision and compassion. 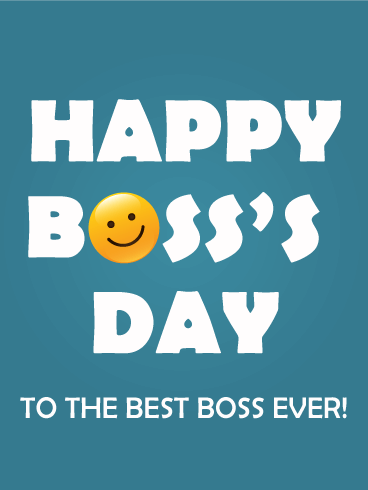 Express your gratitude and wish a happy boss's day today. Send it from yourself or from the whole team. 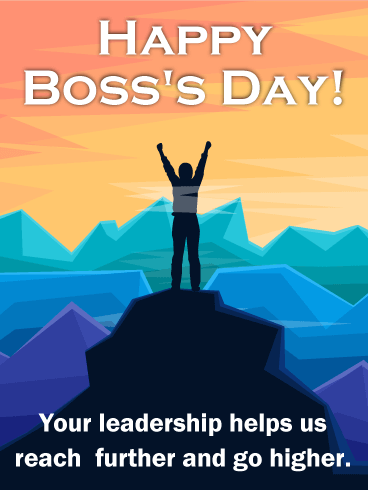 A boss's day card is a thoughtful and fun way to show solidarity and support. Got a boss you trust to blaze the trail? 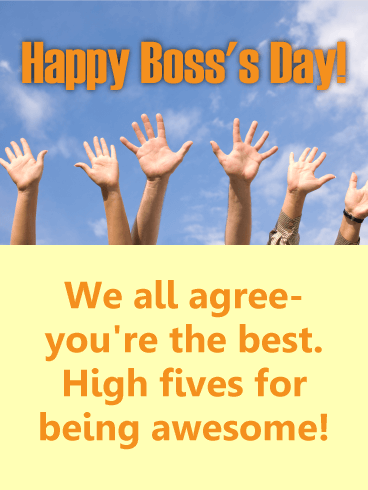 Send this cool boss's day card and tell them so! A good boss isn't afraid to map a path toward success, even if it means climbing a few mountains. Wish a Happy Boss's Day from the whole team. Let your amazing boss know you think he or she is a great trustworthy visionary, and sure-footed leader! We all agree-office celebrations are the best! Add some spice to the day, and remember to wish your fearless leader a happy boss's day! They work hard, inspire the team, and never cease to show up and give their best. A good boss is a rare thing! 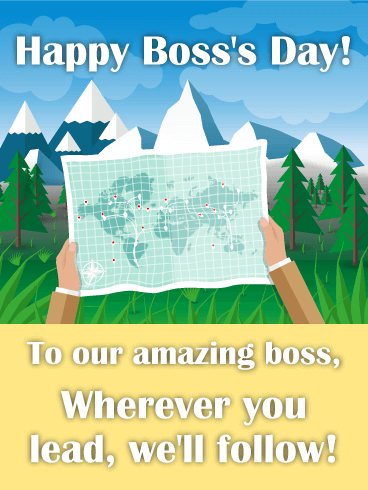 Send this fun Boss's Day card from all of us today. It's full of high-fives and big spirit. Behind every successful team is an incredible boss! Your boss is always the first one in, and the last one to leave. 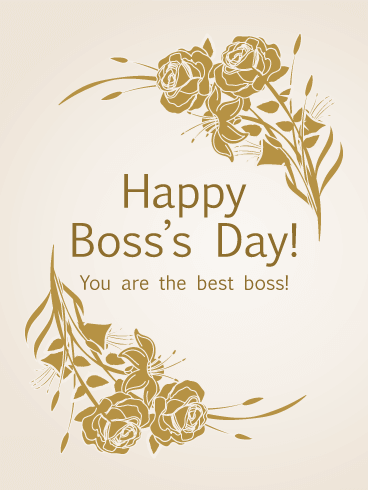 Make sure to send a boss's day card this year that really celebrates your boss's hard work! She/he leads with style and with flair, with grace and with courage-let your amazing boss know she/he is just what your team needs! 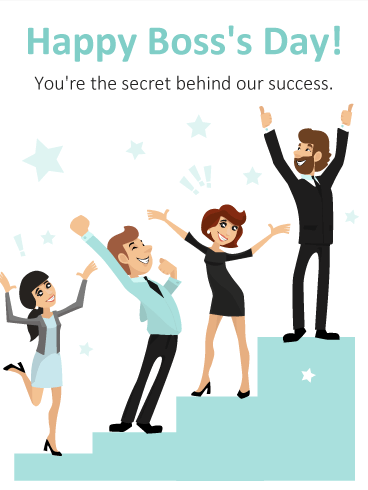 This happy boss's day greeting card let them know they are the secret behind your success! Look, it's a bird! It's a plane! No! It's Super Boss! Boss's Day is right around the corner and it's the perfect time of year to give your boss a boost of encouragement. He's always working hard, leading with grit and creativity. A great boss might look like any ordinary citizen but they are the superheroes of the workplace! 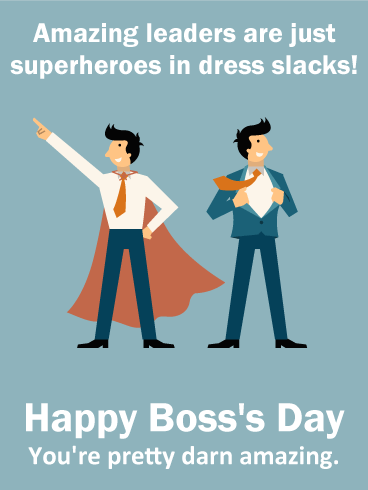 Send this heroic and super fun boss's day card to your boss today. Happy Boss's Day or should we say Happy Fearless Leader Day? Send a modern boss's day card with a funny flair. Life can get dull in the office, so it's good to be a little dramatic every now and again. 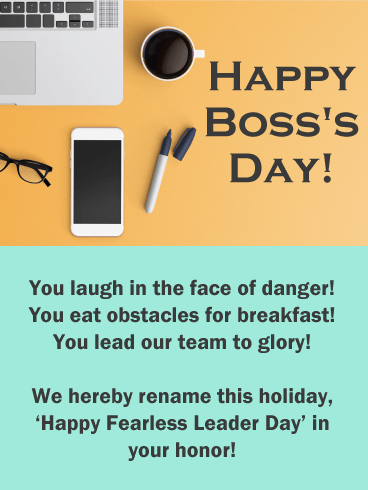 If you have an amazing boss you trust to lead your team to glory (and who likes to laugh), send this funny boss's day card today. It's practically perfect in every way-kind of like your boss. Team work making the dream work! 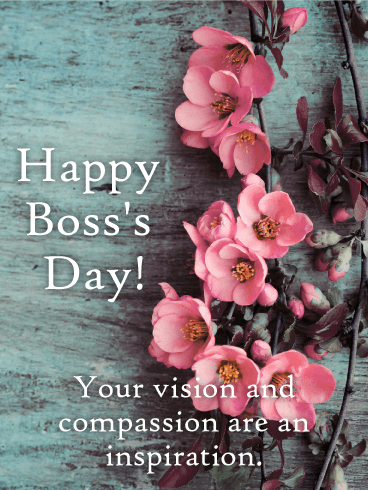 Send your boss this inspirational boss's day greeting card to show your admiration, support, and gratitude for all their hard work and leadership. We often forget to say "Thanks!" to the ones who need it most, and it's true that - it's lonely at the top! Let your boss know you appreciate him or her, and can reach further and go higher with their great guidance and insight. Do you love your job? Do you love working with the people who share your office space? Then let your boss know much you appreciate them with this Boss's Day card! Work together with your coworkers to show your boss how thankful you are for them and their hard work. Make this an exceptionally happy Boss's Day with the smiley face on this card! Your boss works hard to make sure everyone in your workspace is happy and taken care of. 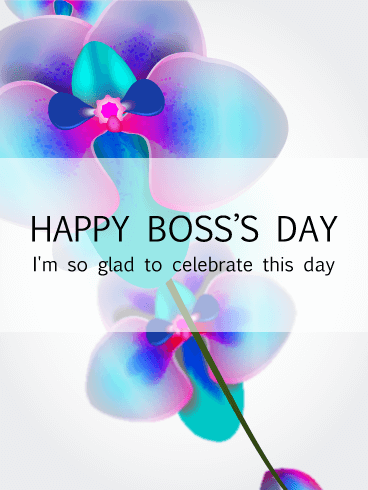 This Boss's Day, make sure your boss is happy, too, by sending them this colorful Boss's Day card! 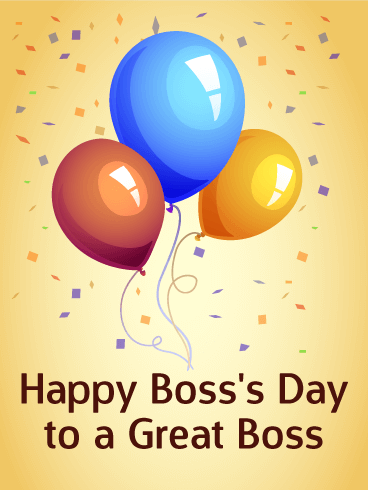 Have your coworkers include a short note to show how thankful you all are for your boss' leadership and care and make this an extra special day for your boss by sending this card! What is the best way to show your appreciation for your boss? By sending them a card and flowers for Boss's Day! Even if you can't get flowers, you can send a beautiful bouquet with the golden blossoms on this Boss's Day card! 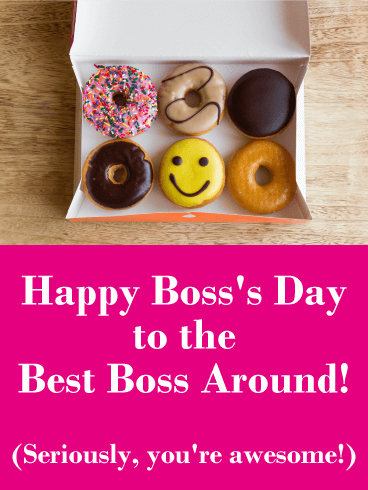 Let your boss know how much you enjoy working for them and how great a boss they are today! Do you have an amazing boss? Do you want to let them know how great they are? 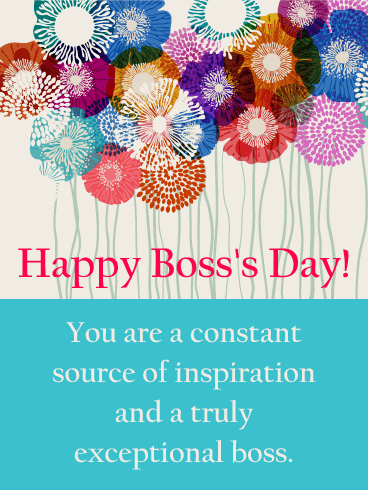 Then send them this Boss's Day card! This fun card is decorated with brightly colored balloons and confetti - the perfect design for a Boss's Day celebration! The sweet message will tell them how awesome they are and celebrate the hard work they do every day!